Sumter decided on a plan of attack of assaulting the camp in three mounted detachments. The initial assault was made early in the morning where Winn's and Davie's men completely routed Bryan's corps. Capt. McCulloch’s company of the British Legion, after presenting a volley, was also routed by Sumter’s riflemen. The Prince of Wales Regt. also came under heavy fire and suffered very severe losses, including Carden who was badly wounded. The King’s Carolina Rangers then came up, and having cleverly deployed themselves in some woods, checked the rebel assault with a surprise crossfire. This allowed the British to drew up on a hollow square in the center of the cleared ground, and to further protect themselves with a three-pounder which had been left by some of Rugeley’s Camden militia. Then, in the heat of the battle, Major Carden of the British Command lost his nerve and surrendered his command to one of his junior officers. This was a major turning point for the Americans. At one point, Capt. Rousselet of the Legion infantry, led a charge and forced many Sumter’s men back. Lack of ammunition made it impossible for Sumter to completely knock out the British. The battled raged for 3 hours without pause, causing many men to faint from the heat and thirst. At the end, the British had lost 192 soldiers; the Americans lost 12 killed and 41 wounded. It should have been a total American victory but the American militia was untrained and suffered from extreme thirst. A small group of Americans came across a storage of rum in the British camp and became so drunk that it became necessary to prematurely start the march back to the base camp at Waxhaw. Thus, the intoxicated Americans were in no condition to take prisoners and let the remainder of the British army retreat to Camden. After making plans and arrangements on the 5th, Sumter with 300, mostly mounted, men under Col. William Hill, Maj. Richard Winn, Capt. Edward Lacey, and Capt. John McClure and about 500 North Carolina (mostly Mecklenburg) militia under Col. Robert Irwin, which included some 80 cavalry and mounted militia under Maj. William Richardson Davie, moved to attack the British post at Hanging Rock. Sumter did not yet have formal rank as Brigadier General, but was selected the senior officer among the group. Hanging Rock, an "open camp" located in a settlement, was occupied by Maj. John Carden with 500 provincials, including 160 of British Legion, under Capt. Kenneth McCulloch and Capt. John Rousselet, a detachment of the Royal North Carolina Regiment, a detachment of the King's Carolina Rangers, and Carden’s own Prince of Wales American Volunteers, posted in some houses, plus at least two cannon. A separate force of Col. Samuel Bryan's regiment of North Carolina Volunteers, a militia/provincial regiment, and some other loyalists, totaling about 700 to 900 were at a position near some woods separated from Carden's main by a creek with a deep ravine. Sumter decided on a plan of attack of attacking the camp in three mounted detachments. Davie, on the other hand proposed leaving the horses behind before making their approach, "urging the confusion consequent on dismounting under fire and the certainty of losing the suddenness and certainty of attack." He was, however, over ruled. The American and British versions differ not a little, hence the extensive quotations given below. The initial assault was made early in the morning where Winn's and Davie's men completely routed Bryan's corps. Capt. McCulloch’s company of the British Legion after presenting a volley was also routed by Sumter’s riflemen. McCulloch himself was killed, which possibly accounts for their flight. The Prince of Wales Regt. also came under heavy fire and suffered very severe losses, including Carden who was badly wounded. The King’s Carolina Rangers then came up, and having cleverly deployed themselves in some woods, checked the rebel assault with a surprise crossfire. This allowed the British to drew up on a hollow square in the enter of the cleared ground, and further protected themselves with a three-pounder which had been left by some of Rugeley’s Camden militia. At one point, Capt. Rousselet of the Legion infantry, led a gallant charge and also forced Sumter’s men back. This allowed the British to drew up on a hollow square in the enter of the cleared ground, and further protected themselves with a three-pounder which had been left by some of Rugeley’s Camden militia. Since Carden was wounded command devolved on Capt. Rousselet. 40 mounted Legion infantry, under Capt. Charles McDonald and Capt. Patrick Stewart, who were on their way to Camden from Rocky Mount, rode to the scene after hearing shooting. These, along with some of Hamilton’s N.C. provincials, after arranging themselves to appear as if greater in number than they actually were successfully charged Sumter’s militia. They were, however, driven back by a counter-charge from Davie’s dragoons. While the main British force held up in the square, many of the whig units lost order and began looting the camp, not a few becoming intoxicated in the process by availing themselves of the British rum. Sumter, out of ammunition, and finding Rousselet’s position now too strong to attack, took his men, now "loaded with plunder," and retreated. The battle was interpreted by both sides as a victory for themselves: the British because they had fought off the Americans, the Americans because they had captured the British stores, took many prisoners, and withdrew in safety. The action lasted three to four hours, with many men fainting from hear and drought. 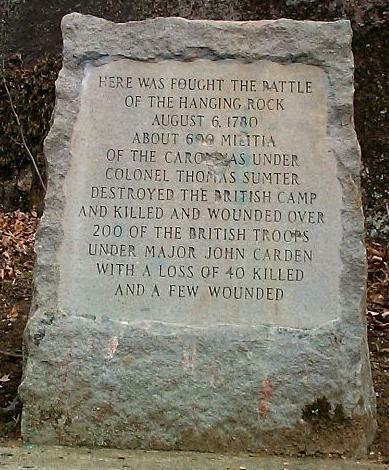 Sumter reported British losses at Hanging Rock as 250 killed and wounded, and that he also took 70 prisoners. Sumter lost 20 killed, 40 wounded, 10 missing. Capt. John McClure, one of the most active partisan leaders in the summer of 1780, was mortally wounded, Col. Hill and Maj. Winn were also wounded but not seriously. According to William Hill in his memoirs, Sumter lost 40 killed and 3 wounded. Tarleton states that the British Legion, alone, lost 22 killed, upwards of 30 wounded, and that the Americans left 100 dead on the battlefield. As well as Capt. McCulloch, the Legion also lost Lieut. Ralph Cunningham. According to a Loyalist source, the Prince of Wales Regt., out of 181 officers and men present, 93 were killed, wounded or missing. The same source says the Royal North Carolinians lost 50 officers and men. Allaire records the King’s Carolina Rangers suffering over 100 lost, mostly of this number taken prisoner. Though not so catastrophic, Davie’s corps suffered significant casualties. Boatner gives Carden’s losses as 192 killed and wounded, while Sumter’s were 12 killed and 41 wounded. The extreme heat only aggravated the suffering of the wounded of both sides. Following the battle, Rawdon at Camden sent the 23rd Regt., under Major Mecan, from Rugeley's to Hanging rock. This allowed Bryan time and room to collect his dispersed force. A historian for the Prince of Wales Volunteers maintains that many of the British prisoners lost at Hanging Rock, were recovered after the battle of Camden.